I leaned back on the comfy seat of a canoe shared with five other travelers in the magical maze of canals at Sacha Lodge in the Ecuadorian Amazon basin and watched a troop of squirrel monkeys overhead. With death-defying leaps they sprang from branch to branch forming a super highway through the tropical foliage. Bets were taken on who would become the first to have a monkey land on their head as the creatures peered at us with the comical faces of a curious child. 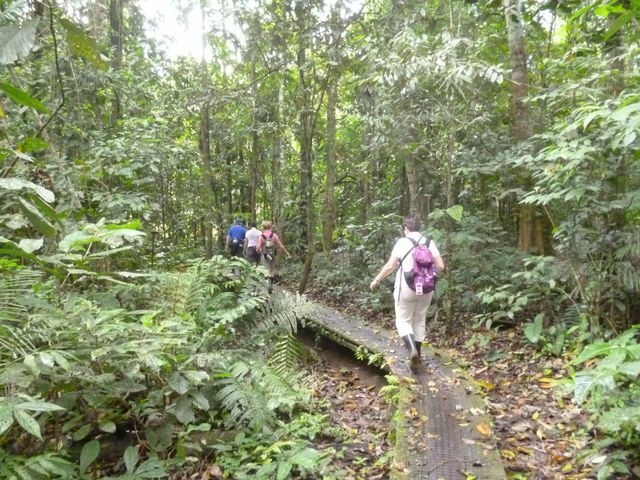 After four days of total immersion in the rain forests surrounding the lodge, I felt I was a part of the scene. This adventure begins in Coca, a gritty oil town where the Coca and Napo rivers collide and proceed to the mighty Amazon River. 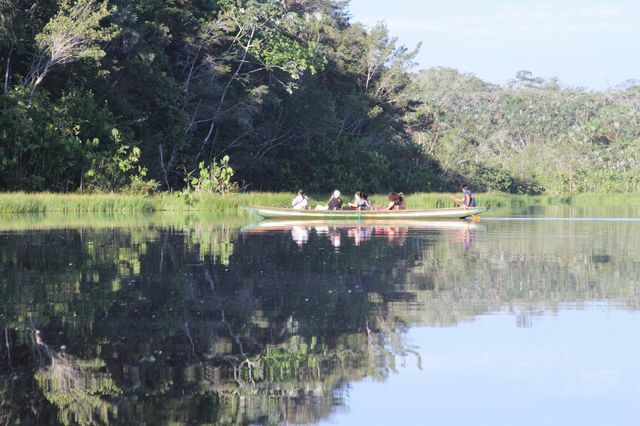 A motorized canoe awaited us on the banks of the Napo, the main artery in the region. On the way to the lodge about three hours downstream, we passed barges carrying heavy equipment to oil depots and locals in canoes fishing as they have done for thousands of years. Children waved to us as we passed remote villages tucked in the impenetrable sea of green foliage. We hiked on a boardwalk through a flooded forest to Pilchicocha Lake, aka the Black Lagoon, where canoes and guides were waiting. 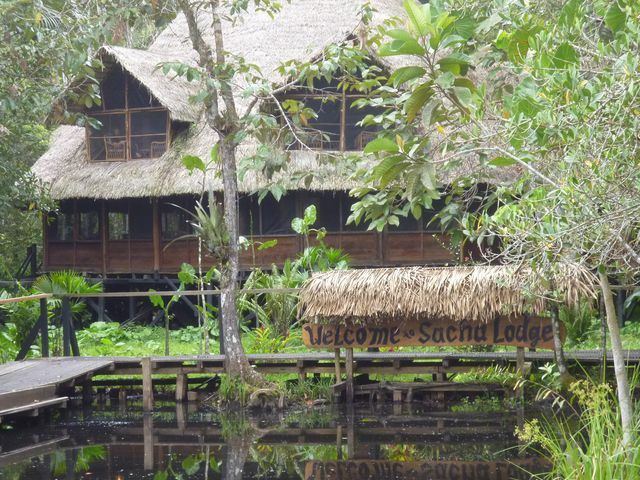 After a serene glide over the lake lined with rhododendron leaves as big as elephant ears and reeds where Caiman (a member of the alligator family) lurk, we arrived at the miracle of Sacha Lodge. Nestled in a 5,000-acre preserve, this Robinson Crusoe fantasy made from local wood covered in a shaggy palm roof and staffed by 65 indigenous workers, is totally self-sufficient. The lounge upstairs overlooking the lagoon is cooled by most-welcome fans after a session of hiking in equatorial heat. Raised walkways lead to spacious rooms with open beam, wood floors, and inviting hammocks on the deck. There is nothing but a screen between you and the wild mish-mash of jungle trees and plants that are home to millions of thrumming insects, barking tree frogs, clicking cicadas, and the sharp whistles of birds that make up the chorus that intensifies as night draws nigh. An early rise increases your chances of spotting some of the 600 species of birds counted at the lodge as well as other wildlife. Forest walks are the classroom for naturalist guides who point out medicinal properties in plants and how they were used by “the people.” They explain the symbiotic relationships between plants and insects that have evolved over the ages. Our guide carried an iPod downloaded with calls to attract the mot mots, toucans, and many more birds, while he talked to other creatures in their language trying to draw them near. Like Jack on the beanstalk, we climbed up a giant wooden stairwell wrapping the kapok tree. A drenching rain set in before we reached a viewing platform above the protective canopy. We stood atop what must be the 9th wonder of the world with our heads tucked into the hood of our ponchos waiting for the weather to change. 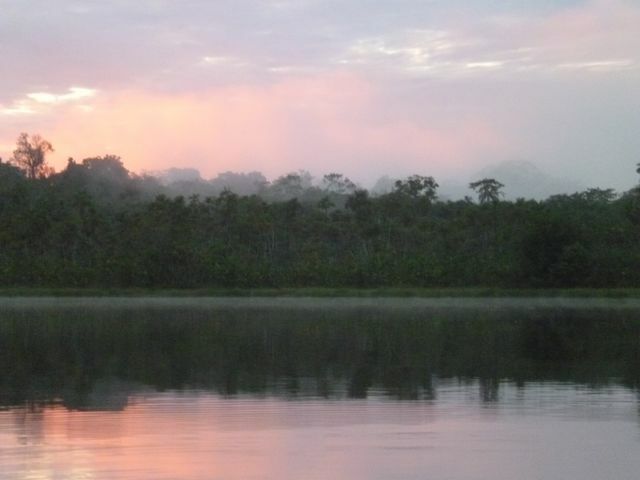 Soon, blue skies opened over the platinum Napo River. Pink flamingo hues softened gray layers of clouds. Shafts of light streamed down upon the primal forest and mist began to rise from the verdant green canopy of the forest below. Orange, crimson, and yellow blooms that rest on the crown of trees brightened the scene. Birds begin to stir once again. 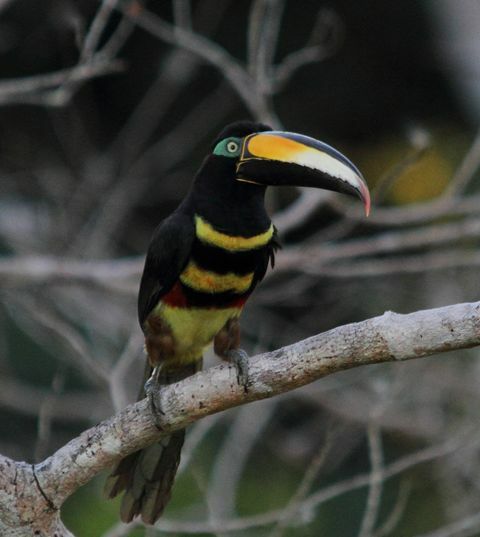 A flock of toucans flew swiftly by and the droplet song of the industrious weaver bird was heard. The sun set with a tender sigh in soft pastels as we left our perch and canoed home through the tranquil channels to the lodge and another fabulous meal. Healthful salads of shredded cabbages, carrot, tree tomatoes, and avocado served with a tangy lime dressing were just a few of the choices. Entrees include tender beef in a peppercorn sauce, chicken, pork and tilapia fish prepared with a unique seasoning known only to our native chef. Wonderful desserts like strawberry mousse, caramel flan, exotic fruits, and walnut cakes were served buffet style in the lodge. On our night canoe, the heavens opened wide with a neon crescent moon hanging in a crackling sky. Marco pointed out different constellations with his powerful green laser. The glide around the lake in splendid silence looking up to the southern sky listening to the serenade of the cicadas and frogs is a treasured memory. IF YOU GO: Cafe Cultura, a boutique hotel in Quito situated walking distance to a farmers market and art in the park, is a perfect place to rest from a long flight. A charming restaurant with tasty selections, a welcoming study, and gracious hosts make this a comfortable safe haven. The staff arranged for an English-speaking guide who took me on a tour of Old Town, a UNESCO World Heritage site, which recently received a 250-million-dollar facelift. They also made arrangements for the driver waiting for me at the new Quito Airport.